GPS system devices are getting more and more popular nowadays due to variety of our daily life requirements which are fulfilled with these GPS devices. GPS navigation gadgets are not only good for location tracking and measuring of areas, but thousands of tasks can be formed with them. It is the GPS system which has easily solved the lands measuring problem around the world. Brunton’s Multi-navigator breaks new grounds in GPS devices market due by combining integrated electronic compass features with standard GPS feature. Along with biometric monitoring capabilities of its systems, the experience of which Brunton got from its wind watch line products category, a multi featured navigation system has been launched by Brunton initially in the US market. The MNS system of Brunton can save up to one thousand waypoints and ten routes, with each route being as far as length of 100 waypoints. The other features which you will enjoy with Brunton’s multi-tasking GPS system is 12-channel reception, UTM, Lat, Lon grid systems, with datum choices. This MNS device is water proof for ten minutes at a depth 0.5 meters or 1 ½ feet. 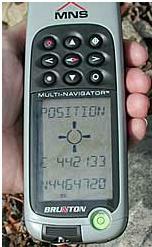 What makes difference between MNS system with other devices is its compass coordination with GPS. For example if you find the straight home feature to be good, this device has successfully integrated the compass feature with GPS device features in mono functioning system. Let’s assume you are going for long distance towards the mountains away from our city for hike and want to sure that you should return trailhead to the home, when you have been returning back, you will need to activate straighthome function and it starts working. With straighthome feature, once you have activated the system for trailhead, its compass mode will start working and gives you the correct location and distance from your home, with arrows guide for turning left or right. Most of the GPS devices which we use nowadays have drawback to work the compass while moving, but in MNS compass system, compass can work even when it is stopped to track the distance. Since the compass has tracked your current position, it will find the decline for south and north around you for your destination. The navigation feature of MNS system like straight home is exceptional and extra ordinary. The documentation in MNS system is also very excellent. The GPS navigation using UTM and other waypoints is one of the best examples you will love to enjoy in its documentation.